One of the best ways to experience the abundance of food choices in New York is take advantage of one of the food tours. I have enjoyed two of the available tours- Chelsea Market/Meat Packing District tour and the Greenwich Village tour. Each three hour experience offers samplings from a variety of restaurants or specialty shops, while also educating you on the history of that area. For $47 a person, you can’t beat this deal! Chelsea Market is the original NABISCO factory. This old, stone building is home to the Food Network studios and a shopping center where you can get anything from fresh produce to fresh lobster. We had samples from the Ronnybrook dairy, from Sarabeth’s bakery, and the L’Arte se Gelato, just to name a few. I visit the Market whenever I go to New York! The Greenwich Village Tour took us through the many new restaurants that are now popping up in the area. We started off the tour with pizza from Joe’s Pizzeria, had cookies at Milk and Cookies, and I tried a new dish- Farro. This is a whole grain similar in size and texture to rice or orzo. It was mixed with butternut squash. While farro can be tricky to find (Whole Foods has it, and Publix carries it at times), it is a wonderful side dish. 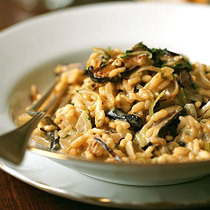 Check out Giada’s recipe for a Mediterranean-style farro. I am thankful for the number of trips I have made to New York. It is a different and exciting visit each time I go, and look forward to taking my kids there one day to experience the hustle, bustle, and culture of a big city!